Self-published zines have become essential reading material for the hip, the angry and the conspiracy-theorist-at-heart. But until recently, most zines have been made with old-fashioned technology like scissors, glue and the boss’ photocopy machine. With her Electronic Hollywood series, Jamie Levy (212/777 4801) has bridged the gap between zines’ underground energy and technological know-how. This electronic zine should appeal to dOOdz, dudes and cybergals alike, but Levy is aiming at an even wider audience. Her intention is to put out a magazine on disc; one that’s accessible to anyone with a Mac. Levy built EH with Macromedia Director and a used Mac II. The result is interactivity for generation X-ers on a budget. Even the format—the cheap, ubiquitous floppy disc—is consciously low cost. Her other projects, an electronic novel called Ambulance ($17) and the interactive bio she created for release with Billy Idol’s Cyberpunk, are sold in bookstores and record stores, not software chains. 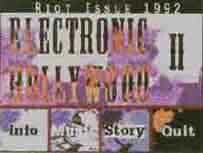 Electronic Hollywood II: The Riot Issue ($6) grapples with the aftermath of the verdict in the Rodney King beating trial. With a repetitive, industrial-Noise soundtrack, EH starts off in assault mode and doesn’t really deviate from its mission to be "straight out of cyberhell and in your face." A menu at the bottom offers you the choice of information about the disk, music samples (from progressive rap group Disposable Heroes of Hiphoprosy and noise band Ethyl Meatplow), written by pieces (Adam Parfrey’s infuriating musings on the LA riots or Monica Moran’s hilarious account of the Home Media Expo). The images were captured on video and Photoshopped into a series of beautiful, grainy shots of industrial LA. Levy could use better writers and longer music samples, but for six bucks, who’s complaining?